Brief Description of Subject: Christ rising, leaving footprints behind, into a bright shaft of light. Angels appear on both sides with the eleven disciples and Mary below on each side. Six kites above have relevance . 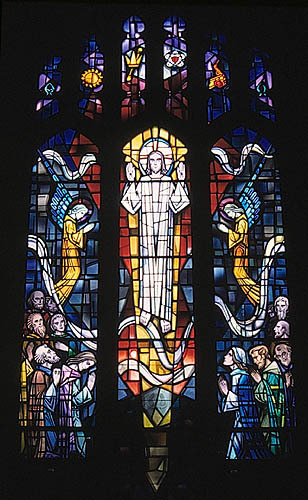 Jesus ascends into heaven while his mother and disciples watch, as related in the Book of Luke 24:51.